Shinran and Honen wondered what was the purpose of Shakyamuni Buddha’s coming to this world. What is in fact the profound signification of the Bodhi Mind related to the Mahayana teaching? Furthermore, what is the purpose of the Enlightenment of a Buddha? Isn’t the Bodhi Mind, the aspiration to reach Buddhahood for all beings? And once this is reached, aren’t all beings invited to share in it? The Enlightenment of a Buddha isn’t a selfish act, as Nirvana is not selfish in Mahayana. Seeing things from only one perspective, centered on you, is a limited vision, and belongs to ignorant beings, but for a Buddha or a Bodhisattva, the vision is universally centered, everything being included in his Enlightenment. Discrimination exists only in our mind, but not in the mind of a Buddha. So, has Shakyamuni appeared into our world only for a particular category of people, that is, only for those able to reach Nirvana by themselves, or in accordance with the Bodhi Mind, his Enlightenment envelops all beings, no matter their capacities? Shinran and Honen thought that the latter is true because it is in accord with the Buddha’s Infinite Compassion. It cannot be in another way, because otherwise Buddhism would seem pointless for a man like me, who is incapable of any virtuous practice and is full of various attachments. Is solely to expound the Primal Vow of Amida, wide and deep as the ocean. "To begin, the teaching of the Pure Land way is found in the Larger Sutra of Immeasurable Life. The central purport of this sutra is that Amida, by establishing the incomparable Vows, has opened wide the dharma-storehouse, and full of compassion for small, foolish beings, selects and bestows the treasure of virtues. It reveals that Sakyamuni appeared in this world and expounded the teachings of the way to Enlightenment, seeking to save the multitudes of living beings by blessing them with the benefit that is true and real. Assuredly this sutra is the true teaching for which the Tathagata appeared in the world. It is the wondrous scripture, rare and most excellent. It is the conclusive and ultimate exposition of the One Vehicle. It is the right teaching, praised by all the Buddhas throughout the ten quarters. 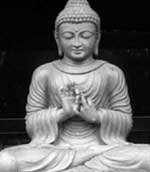 To teach Tathagata's Primal Vow is the true intent of this sutra; the Name of the Buddha is essence." by joining hands and bowing down toward him. He will instantly enter the Stage of Assurance. So I am always mindful of Amida." In Buddhist history, there are many examples of spiritually evolved Masters who, even though they followed practices based on personal power, still felt the need to recite nembutsu and seek refuge in Amida. They recommended this practice to their disciples, too. Therefore, if even these wise masters relied on Amida’s Compassion, thus showing how hard it is to become free from birth and death, how much more people like us, full of attachments, of this confuse modern era, should even more seek refuge in Amida. "Since it is extremely difficult to free oneself from blind passions and the hindrances of karmic evil in this life; even the virtuous monks who practice the Shingon and Tendai teachings pray for enlightenment in the next life. In our case, what more need be said? We lack both the observance of precepts and the comprehension of wisdom, but when, by allowing ourselves to be carried on the ship of Amida's Vow, we have crossed this ocean of suffering that is birth-and-death and attain the shore of the Pure Land, the dark clouds of blind passions will swiftly clear and the moon of Enlightenment, true reality, will immediately appear. Becoming one with the unhindered light filling the ten quarters, we will benefit all sentient beings. It is at that moment that we attain Enlightenment." Nagarjuna (approximately 150-250), is dubbed the”father of Mahayana Buddhism” and is famous for his rejection of any affirmation about the ultimate nature of reality in the Mahayana doctrine of emptiness. He founded the school of Madyamika (Middle Path) dialectics. The teachings of this school, together with the Yogacara teachings are the basis of Mahayana theory and practice. Also, he is considered by Shinran as one of the seven Patriarchs of the true Pure Land teaching (Jodo Shinshu), due to his works related with Amida Buddha. Famous Japanese Buddhist schools in the time of Shinran Shonin.